Mutekiya’s menu stated that they take 20 hours to create the broth for the ramen and use only the best roast pork. Typical with busy ramen shops like this one, we had our order taken in line and then waited for a seat to open up inside the cramped restaurant. We lucked out in that in only took about 15 minutes longer to get in and we sat down at the counter. I sighed as my legs didn’t come even close to fitting under, having to basically flex my feet and thighs into what felt like I was doing a leg exercise, not exactly comfortable. Fortunately, the ramen made the pain worth it. There were massive chunks of melt in your mouth roasted pork, perfectly chewy noodles, two flavored eggs, vegetables all swimming in a fantastic broth. Now we knew why there was such a long line. We happily slurped away and kept our chats to mostly guttural noises in approval. I was freed from my leg torture, and we headed towards the center of the district. Ikeburkuro is the center for female-based anime and magna. In order to check out this interesting sub-culture, we first went to the 9 story Animate! Store. Each level had a specific subject or type of media – DVD, comics, costumes/accessories. Not surprisingly, most of the people there were school age girls and a few boys. While it was interesting, we realized what we really wanted to see was in Akihabra – which was on the other end of the metro line. In the meantime, we decided to finally check out one of the large Sega arcade centers, which we had seen all over town. This particular location seemed to be nicer than others we had seen while exploring Tokyo. The first level was mostly carnival type games and the upper levels were for arcade games. We saw a lot of blasts from the past, from Street Fighter to House of the Dead. However, there were also some very Japanese-specific games, including a horse racing game where mechanical model horses controlled by the gamers went around a large track. Chris got some footage of it here. There was also a multi car Super Mario Kart so Chris and I took a turn at it. He won while I came in second. Still, the most unique touch came when I went to the bathroom. In front of the first urinal was a monitor with 2 characters in a typical fight game stance. As soon as I started to relieve myself, they sprung into action and started a fight. I looked down and sure enough there were instructions on where to aim. I was victorious! It was pretty much impossible to top that bizarre experience so we headed back to the station to make the 30 minute train ride to Akihabara. We exited the station and walked over to the main drag of Akihaba (as various signs called it) First up was their version of Animate!, which seemed to be geared more toward boys/guys. I didn’t recognize almost any of the titles on the various floors but it was still a fun way to experience such a critical part of Japanese pop culture. We also checked out a couple of arcades but they weren’t quite as good as the one in Ikeburkuro. Plus, we wanted to try and avoid the crush of rush hour so we made our way back to Shinjuku. For our Last Supper, we thought it would be fun to check out this yakiniku centered around wagyu beef that was two doors down from our hotel. 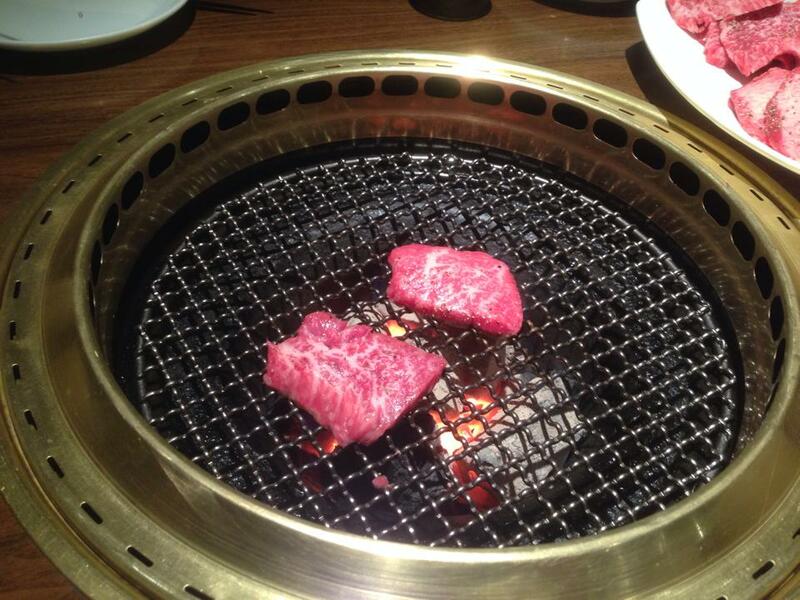 In a yakiniku, you cook your own food over a charcoal grill that is in the center of the table. They presented us with 2 different combination menus along with ala carte pricing. 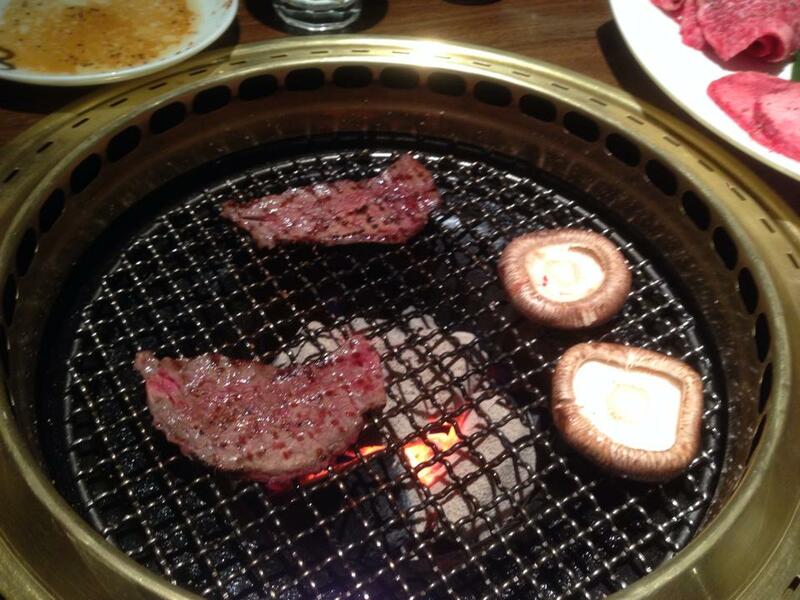 Our server also turned on the grill, which started to heat up very quickly. It was a no brainer to go with the wagyu special, which consisted of wagyu spare ribs, loin, tongue along with some spiced chicken, vegetables and some slab bacon. The beef was sliced thin enough that it would be virtually impossible to mess it up. We started out with the spare ribs, which had been lightly pre-seasoned. The meat cooked fast and within a couple of minutes we had our first taste. 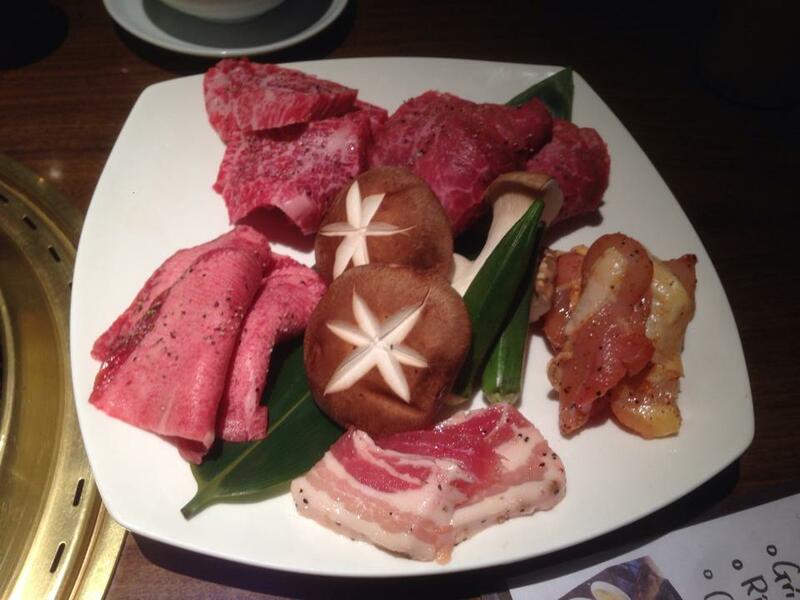 It was unbelievably tender and enhanced greatly by that one of a kind Japanese charcoal. Next we tried the loin, which was also superb. However, the real winner was the tongue. I’m normally not a fan as it tends to be a bit tough or chewy. This though simply melted in my mouth with a deep flavor. We next cooked both some mushrooms and the chicken thighs – both great but no wagyu. In a matter of minutes, we had gone through all of the wondrous beef. Chris wasn’t sated yet so he ordered the thick tongue since the thing one was so good. I only had a piece but it was superb. He asked for a final suggestion and our server at first recommended the rare loin cut but then came back to say it was sold out. Chris instead got another order of the other loin cut, and I enjoyed watching him ooh and ahh with pleasure with his meat paradise. My sweet tooth needed attention and after asking our server for somewhere to go, we ended up at Baskin and Robins, which was a short walk from the hotel. I wanted to try something that you could only get in Japan but nothing was in English so played it say with some cherry burgundy. It was a nice capper to our last full day/night in Tokyo, and we complemented ourselves for going out in style. Posted on April 13, 2014 by reyalto. Bookmark the permalink.